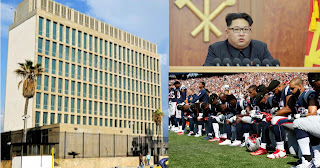 RussJones.Us: Bombs, Footballs and Cubans - Oh My! Bombs, Footballs and Cubans - Oh My! North Korea wants to develop a Hydrogen Bomb. Yea that sounds like a good idea - NOT! How many NFL players are going to kneel this week? I don't know, I stopped watching NFL football a long time ago. Apparently, a bunch of our diplomats in Cuba were poisoned, seriously. Now you can't get a visa into the country from the USA. Oops! God warned us that the whole thing would come flying apart at the seams. So how can you have peace and security in a world that cannot offer it? #1 - Don't rely on this world to provide peace. There is no way this world can provide any kind of peaceful utopia for mankind to enjoy. #2 - Know that no matter how bad it gets here, God has a plan. Jer. 29:11 tells you that He has a plan. Remember, that His plan for you is very, very good. But you need to find out what it is. #3 - Peace comes from God, and you will find it in your heart - not in your circumstances. So many times we look to our circumstances to give us peace and hope. No, will never happen. But the presence of God in your heart every day? Now that's something you can enjoy.